I loved to play with Lego's as a child. I would usually make abstract type buildings and furniture for my Barbies. The boxes of Lego's that we would get as children did not have those very specific pieces that they do now. We did not have the instant kits to make a helicopter (complete with propellers and pilot) or a firetruck (wheels and driver included). We used our imagination. 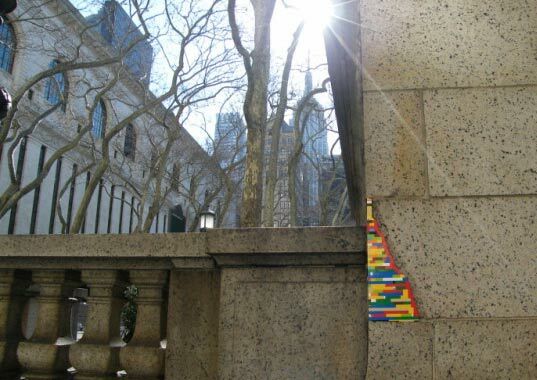 NYC seems to be using their imagination as well...at least when it comes to crumbling buildings and walls. Artist Jan Vormann got together volunteers ages 3 - 40 to help transform the city. I think this is totally cool! I want to go to NYC just to look for Vormann's installations!